Wonderful Vaseline Glass dessert bowls – a treasure I found in Ventura over the weekend. Baking From My Home to Yours is my favorite baking book. With all the summer fruits and ice cream making, I started to miss apple desserts and I had some Cranberry Hazelnut Bread from My Florist Cafe and Bakery. I didn’t have any Apple Butter, so left it out. 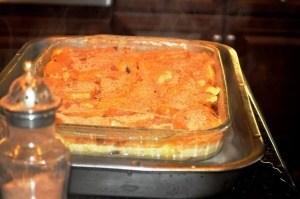 And, I sprinkled Cinnamon Sugar all over the top of the Bread Pudding. 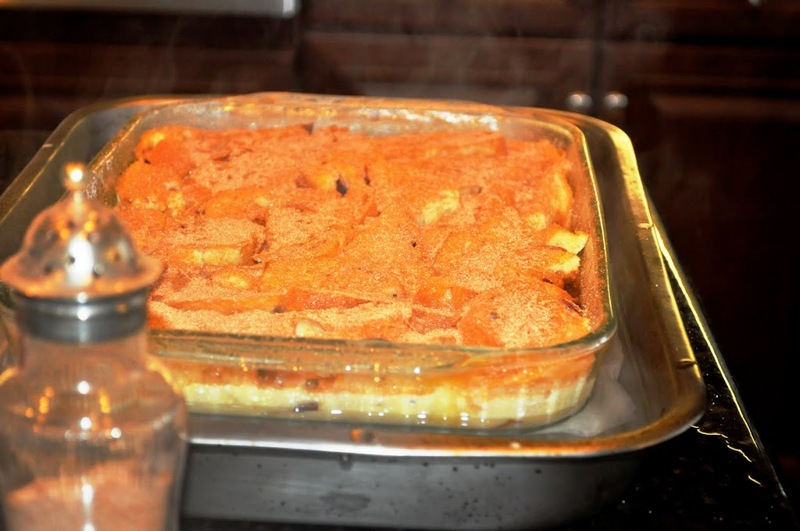 This is a wonderful dessert filled with caramelized apples and imbued with rich egg custard. 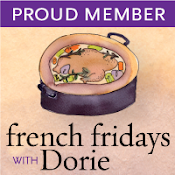 Dorie says you can use a number of different fruits. I loved the apples, but think it would be great with peaches, too. Best served warm with yummy caramel sauce! Sitting in a Bain Marie ready for the oven! 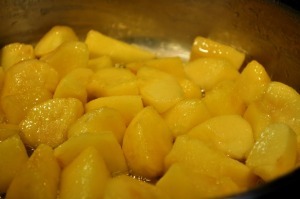 Boil over medium heat for 10 minutes, whisking occasionally. Remove from heat and stir in 1 Tablespoon Bourbon. 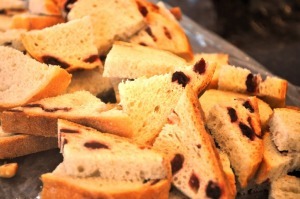 Pour over Bread Pudding while warm. Wow! That looks so yummy! 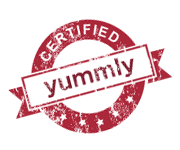 Fall is right around the corner…I love fall and the wonderful food that comes with it! Like apples and pumpkins! I am so glad that it is getting to be apple season again! Mmm..this looks fantastic with the bourbon caramel sauce. Wow, this looks delicious! 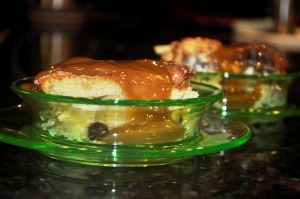 Bread pudding is one of my favorite desserts and that caramel sauce just knocks it out of the park! I am so ready for fall baking and this just looks so lovely and fallish!! I must try it! I love your green glass bowls, I think any thing you served in them would look amazing but this apple bread pudding would look good on a paper plate too! oh yum! I have a pie bookmarked in Dorie’s baking book, don’t we just love her recipes?